I spent Thanksgiving weekend in North Carolina and loved being able to relax and visit with friends and relatives. My older son has lived there for 25 years so I’ve visited dozens of times. We got to meet the new baby cousin in the family; he slept through all the excitement. And I spent time with my two darling and precocious grandsons. The 2-year-old loves to read stories, to which he adds his own interpretations as I’m reading to him. One of our outings was to a birthday party for one of his friends from “school” (day-care). Mom and the two boys and I went to The Little Gym where kid birthday parties are staged. An hour of jumping, bouncing and games, supervised by Mr. DJ and Miss Bethany, then time for cake and birthday treats. If you haven’t been involved with small ones lately, you would be amazed at the birthday party industry that has built up. I’ve been to several play-party venues like this for kid birthday parties, including those for the two grandsons. Birthday parties aren’t held at home any more. The almost-7-year-old likes to build with Legos and write stories. He has a future as an entrepreneur, I believe. He frequently writes stories, by hand and with colored illustrations. He begged me to “publish” his stories and wanted me to take a photo of a magazine cover so he could put it on his book. I explained copyright infringement. We discussed the nature of e-books and the dilemma of print vs. online. I told him he needs a website, after he asked me how he would get people to buy his book. I can’t wait to see what we’ll discuss next time I see him. The grownups went to the theater one night to see Snow Queen, based on the Hans Christian Anderson story, at Triad Stage in Greensboro. The play, developed for that theater in 2013, was well done with an original folk music score and script. Costuming of the Snow Queen and other fairy tale characters was beautiful and the staging, with large animal puppets, was very creative. This is a professional theater company and most of the actors are Equity. The show featured live musicians on acoustic string instruments. The play is set in Appalachia, which explains the accents of the actors. Here’s a sneak peek at the play with comments from writer/director Preston Lane. If you’re in the Triad region (Greensboro/Winston Salem/High Point) before December 22, you have a chance to see this production. Also in performance . . . .
My other treat was watching my son teach a university economics class in time-series analysis—used in statistics and forecasting. (It was the day of my departure and I tagged along with him.) There were six graduate students in the class, so I sat in the last row of the small classroom and tried to be inconspicuous. Of course, my son wasn’t going to let that happen. He introduced me to the class and occasionally asked my opinion. Image courtesy Wikimedia Creative Commons. The class was discussing things like ACF (autocorrelation function) and the ARIMA methodology (autoregressive integrated moving average) and my son’s white board formulas included characters that aren’t on my keyboard. 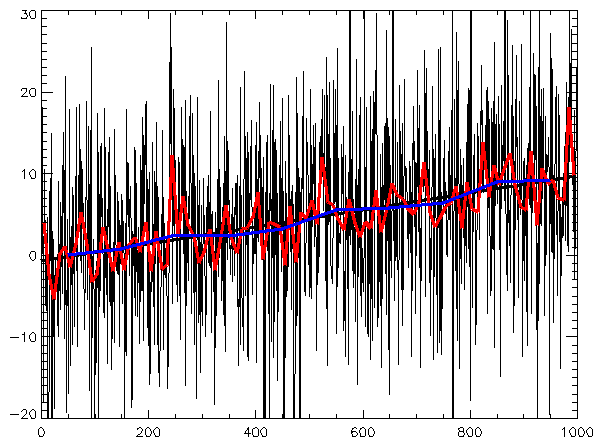 This is an image of a time series showing random data points. It’s cool-looking and I like the colors. With the help of Wikipedia, I followed along superficially and I did perk up when he got to the chi-squared test. I remembered that from my brush with communications research as a grad student. The chi-squared (X²) test is used to determine whether there’s a significant difference between the expected and observed frequencies in categories. The class also had two interesting stats. Of the six students, three were left handed. And of the eight people in the room, four were left handed, including me, of course. Statistically unlikely since ~10 percent of the population is left handed. And all six students were male, also defying the stats, since 50 percent of the population is female. That may be a comment on the fact that fewer women are involved in STEM courses. It’s a sad fact that this results in a “yawning imbalance . . . even though they make up 47 percent of the total U.S. workforce, women hold only 24 percent of STEM jobs, according to a 2011 U.S. Department of Commerce study.” Those STEM jobs typically offer higher salaries and better career prospects. I realize the irony of this comment coming from me. I took only the required STEM courses in college and I spent my career in decidedly non-STEM jobs. I’ve had a successful and happy life and I wouldn’t have changed it. But I would advise young women to consider all their career options and not let themselves be pushed into non-STEM courses and careers. Anyway, it was fun to watch my son teach and then we had a late lunch. Then to the airport and home. PTI (the Piedmont-Triad International Airport) has free wifi, as do many other airports. Why don’t O’Hare and Midway have free wifi? OK, they do have those rotating toilet seat covers that make you think you’re sitting on a clean surface. But no free wifi? It’s a tossup as to which is more important. I loved your entire journey via journalism reporting. And, especially the “clean” revolving toliet seat! As a parent, Andy must have his hands full w/such an interesting child.